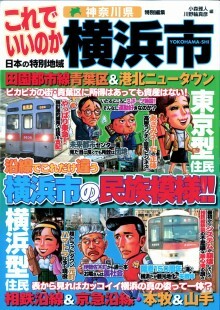 This image from the cover of a mook normally dedicated to evaluating different parts of Tokyo. In honor of the 150th anniversary of the opening of the port, this edition evaluates Yokohama. The image s in the upper band represent the Tokyo-oriented folk who live along the Tokyu railway lines. Those in the lower band represent real hamakko, Yokohama-oriented types who live, work, and play in Yokohama. Previous entry: Happy New Year!